Texas has had an interesting yet deceptive history when it comes to the subject of drum and bugle corps. There are even misconceptions within the drum corps community that participation from Texas is a recent trend. As will be seen, Texas has played an important and much longer role throughout the history of the drum corps. 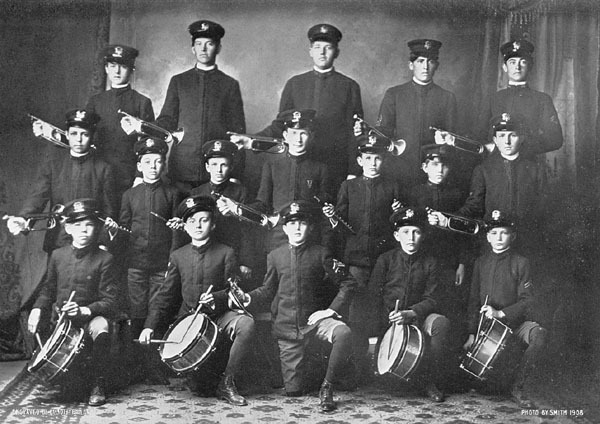 The earliest evidence of drum corps in Texas can be found during the 1900’s, with the Peacock Military Academy Drum and Bugle Corps of San Antonio. This group was one of the most important groups at P.M.A. and was a vital ambassador throughout the state and country. From research, this corps used to compete with other corps throughout the state. There was a contest that took place at the Texas State Fair in Dallas that seemed to be a culmination of their competitive season. Various local American Legion Posts also sponsored their own drum and bugle corps. These organizations saw drum corps as a way of continuing military traditions, encouraging discipline, as well as an espirit-de-corps among the youth and members of the posts. These corps represented the posts at public gatherings. They also would compete yearly to determine the best corps in the state and nation. There are a large number of these groups that still perform. Shriner Corps were able to become established throughout the various parts of the state. These corps become an integral part in the promotion of the various Shrines that they represented. Shriner Corps continue to provide an active and public arm for the Shriner organization. The corps continue to compete against each other on a national level. The writer of this article does remember the Dallas Shriner Corps defeating the Shriner Corps from Rockford, Illinois for the 1990 National Championship. Football was also a factor in the creation of drum corps. Many of the drum corps in the 20's and 30's were associated with high schools and were there to support and foster school spirit. There were a number of corps were also all-girl corps. They were very high-spirited groups and many of these corps, like the Red Hussars of Port Arthur (a group that rejected Janis Joplin for membership) and the Bengal Guards of Orange had strong national reputations. These groups were very strong organizations on their campuses. As stated earlier, many of these drum corps, regardless of affiliation would gather to meet for various competitions, culminating with a Grand Championship taking place at the Texas State Fair. The American Legion, which was one of the original governing bodies of drum corps before DCI held three of their championships in Texas. In 1964, the Finals were held in Dallas (Cotton Bowl). The Junior title was won by The Garfield Cadets and the Senior Title by the Hawthorne Caballeros. In 1971 (Yankee Rebels) and 1979 (Long Island Kingsmen), the Championships were held in Houston. However, the rise and development of instrumental music education in public education during the 40's and 50's and specifically the growth of marching bands spelt the end of many drum corps. Although these groups no longer exist, former members continue to meet on a regular basis. Unfortunately, many of these corps, their members, and their histories have been lost to the mists of time. With the rise of Drum Corps International as the main governing organization, there were attempts at creating a Texas-based drum corps in the 1970's, including The Lone Star Regiment (Bedford) and the Texas Crusaders (Ft. Worth). But these were short-lived corps that were not able to get past their first year. In the 1980's there were further attempts at creating a Texas-based drum corps. The Crossmen of Westchester, Pennsylvania attempted to help to assist the Alamo Marksmen in San Antonio. After a few years, the Marksmen were not able to get off the ground. The Nighthawks (Houston) were able to compete in DCI successfully as a Class A corps for the first part of the 1980's. Unfortunately, a lack of finances ended the great potential this corps had after a three year run. In the mean time, many marching members and staff joined drum corps in increasing numbers. The growing influence of DCI was a contributing factor to this. In addition, many alumni of drum corps entered the arena of music education and encouraged their students to try drum corps. 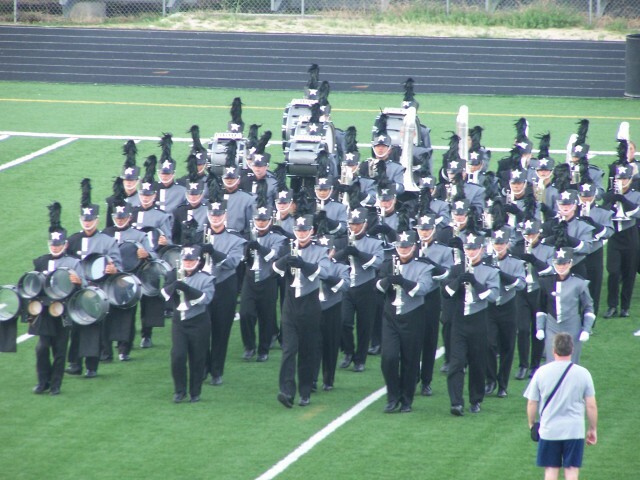 Attendance with local drum corps rose steadily, resulting in the number of shows in the state. In the last decade of the 20th Century, there were a number of signifigant factors contributed to the 1990’s being a very strong decade for drum corps. In 1990, a huge piece of news reverberated throughout the drum corps world. The Sky Ryders were a perennial crowd favorite and a consistent DCI Finalist from Hutchinson, Kansas. The corps had always had a strong tie to Texas through it’s members and staff. Late in the 1980’s the corps began to fall victim to various finacial troubles. It was decided that to save the corps that it should move to where it had better opportunities to establish a more solid financial footing. So the corps moved to the Dallas suburb of DeSoto. Another factor was the creation of Lone Star in 1991, which would end up becoming one of the longest lasting DCI corps from Texas. Around the same time, the Bayou City Blues (Houston), was able to get off the ground, helping to establish a senior corps presence in Texas. Throughout the 1990's drum corps continued to build up support. The number of shows in Texas increased. There was further growth with such corps as Texas Legion (Arlington) and Legend of Texas (Lubbock) being established. Unfortunately, drum corps growth hit a truly bad spot. For one reason or another, The Sky Ryders, Lone Star, Texas Legion, and Legend of Texas had all gone inactive by the end of the decade. Although all these corps no longer are in existence, they did prove that drum corps could be a viable activity in Texas. Since the rise of DCI, many members and staff have been recruited from Texas. Texas has also been home to some of the most well attended drum corps shows. The state has also shown great hospitality to many of these visiting corps. All this helped to establish the state of where things are at now. There are now over ten drum corps shows that now take place in Texas, including the DCI Southwest Regional at the Alamodome in San Antonio and now the DCI West Texas Regional . The Dallas and Houston shows are considered two of the best shows to perform at outside a DCI Regional. There are even unique drum corps events such as the Drum Corps Tigers BBQ Bash and the Drum Corps Preview on the steps of the Capital in Austin. In 2000, Revolution (San Antonio) established itself as a force to be dealt with. They are the Division III Champions and were most recently the silver medallist at the Division II Championship. With solid footing on both the financial and creative ends, it is hoped that Revolution will continue to be a strong part of DCI. Trinity (Seguin) made an attempt to field competition corps. Although the corps had a lot of heart and enthusiasm, they were not able to keep financially afloat. Currently the corps has been inactive the last few seasons and it’s future is uncertain. The Crossmen (San Antonio), a perennial DCI Finalist, has now moved from the East Coast to San Antonio. After being a part of the Cadets’ umbrella organization, the corps is striking out in the hopes of increased membership and improved placement. They currently are based out of Ronald Reagan High School. They are beginning their second season in Texas and yet still keep the traditions they have had since their initial merger in the late 70’s that created the modern Crossmen – Go Bones! Gulf Coast Sound (Houston) is the evolved version of the defunct Bayou City Blues. They continue to foster the drum corps ideals that were established by Bayou City. Frontier (Dallas) was established by alumni of various corps who were looking for a way of continuing their drum corps dreams. Frontier not only has thrived as a competitive DCA corps, but have established themselves as a important part of the Fine Arts Scene in Dallas. From the Austin-area, you have The Austin Stars, who will be competing at DCA for the first time in their history. The corps was founded by former Lone Star staff alumni Brent Unger, who also founded the successful Music City Legend. And then there is World Gone Mad. Be afraid, very afraid. Finally, there are also possible units being formed both for DCI and DCA. It is hoped that there will be more concrete information that can be added to this history in the near future. The history of drum corps in Texas is long one and far from being completed. With any hope, the story will continue and flourish. For a list of known drum corps, junior and all-age, click on one of the links below.